The Thanksgiving tradition is, we overeat. ‘Hey, how about at Thanksgiving we just eat a lot?’ ‘But we do that everyday!’ ‘Oh. What if we eat a lot with people that annoy the hell out of us?’"
Oh, my goodness, how expensive can Thanksgiving dinner get? VERY! Especially if you're the one hosting! But never fear my dears, here are 10 super simple ways to keep your sanity and your budget in check this year and the next and the next and... you get the point. ► Compare Grocery Sales - Most major grocery stores post their Thanksgiving sales paper online so it should be pretty easy to take a few minutes to compare sales and go where the better prices are. ► Stick with the Classics - If you're on a tight budget you might want to refrain from adding new dishes to your menu. Thanksgiving is a holiday steeped in tradition and those foods are expected and often well anticipated. I'm sure none of your guests will be disappointed if you stick with the same old line up - it's all delicious. 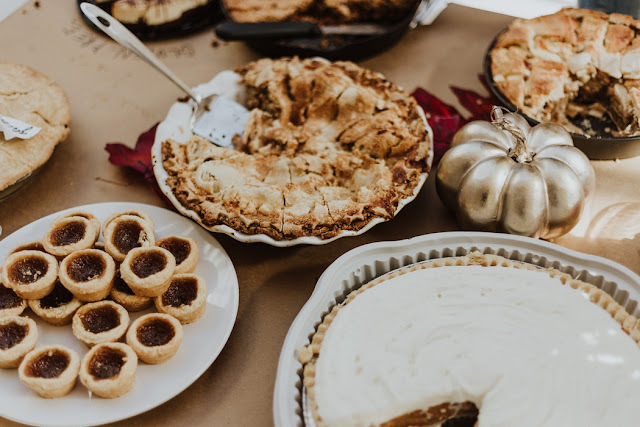 ► Narrow Down Your Menu - All my life my mom's Thanksgiving menu has been as follows: Turkey and dressing, ham, green beans, cornbread , creamed corn, sweet potatoes, mashed potatoes, potato salad, collard greens, three pies, and a cake. Not that I'm complaining because it's all so delicious but is it really necessary to have Turkey AND ham? Mashed potatoes AND potato salad? Dressing AND cornbread? And three pies? Holy moly! Cutting back on your menu will not only save you money but precious time and energy as well! ► Go Off-Brand - Off-brand products are often times just as good as the original. They're already inexpensive and will most likely go on sale before Thanksgiving. You can cut your Thanksgiving grocery bill in half by taking advantage of off-brand on sale! ► Say NO to Disposable - Even though the idea of simply throwing away your plates after Thanksgiving sounds absolutely heavenly - the convenience of it will cost you. So get fancy with "real" dishes and cloth napkins , and skip buying paper plates, plastic cups, disposable cutlery, paper napkins, and single-use cooking dishes. Ask kids and teens do the dishes for you in exchange for the last piece of cake or something equally tempting. 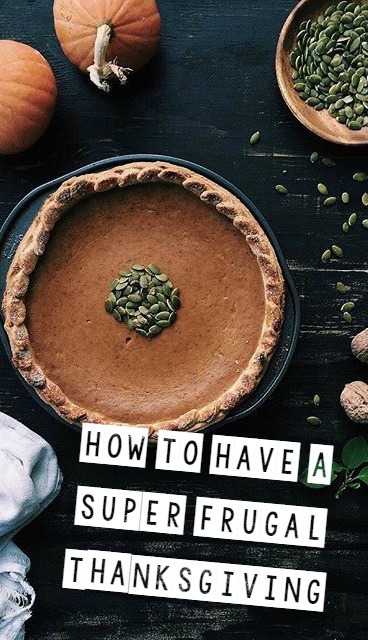 ► Go Homemade - If you're looking to have a frugal Thanksgiving, buying prepackaged food and catering is definitely not the way to go. A local business where I live is charging $25 for a sweet potato casserole and $25 for green beans with new potatoes - each dish has enough for 6-8 people. That's $50 for only two dishes! If made completely from scratch, a sweet potato casserole should cost you no more than $15 and green beans with new potatoes, around than $10. ► Get Your Decorations from Mother Nature - Instead of buying centerpieces and other Thanksgiving themed decor for your home, try going outside and seeing what the world has to offer. Colorful leaves, acorns, sticks, dried grass and herbs cost nothing! All you need is a little bit of imagination or some good inspiration from Pinterest! ► Provide Appetizers - Giving your guest something to nibble on before dinner can help cut down on the need for so much food as well as food waste. Something like a simple veggie tray or cheese and crackers, even chips and dip should do the trick! ► Skip the Booze - Cutting out fancy cocktails and beer and wine can save you a significant amount of money (and reduce the risk or awkward drunken Thanksgiving toasts). But if you insist on having a little sippy-sue, go for a box of decent wine like Franzia or go strictly BYOB. ► Go Potluck Style - Don't be afraid to ask guests to pitch in! Simply contact your guest and either ask them what they would like to bring or assign a dish or two for each household. All you'll need to do is provide the turkey, but you just might get lucky enough to have someone offer to bring that too! Do you have any great tips for saving money during Thanksgiving? Let me know in a comment below! These are great tips, especially the one about narrowing down the menu! I always make WAY too much food...LOL! We do potluck (and about a zillion different pies...Thanksgiving is pie day in my family!) at my aunt's house for about 25 people. If you do want to do disposable, get your plates and napkins at the dollar store. If you have a big crowd, that can help a lot. I love your Jim Gaffigan quote! (He's one of my favorites.) Potluck style is the way to go. Everyone pitches in, which not only helps with costs, but also all of that work.